Zuji Singapore is showing its cheeky side with its latest campaign. 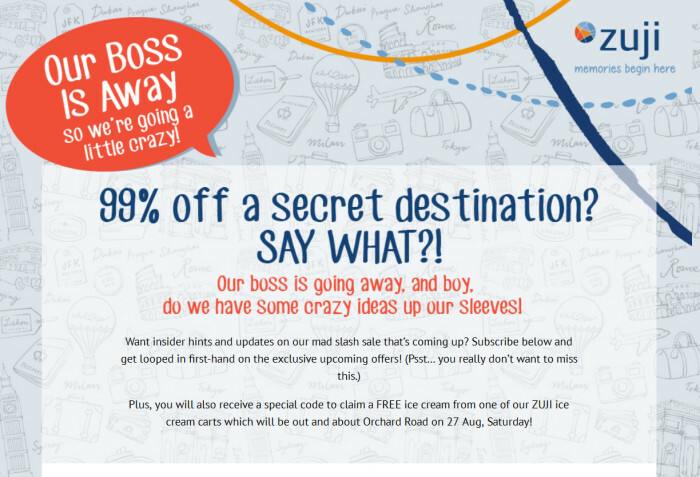 Claiming that because the CEO of Zuji Singapore has finally decided to step out of the office, the marketing folks at Zuji decided to offer the public 99% off on a secret destination. As they say, when the cat’s away, the mice will play. The campaign, appropriately titled “The Boss is Away”, has a designated microsite that allows members of the public to receive first-hand exclusive hints and updates on the sale and future campaigns. Zuji subscribers will get notified of these deals before the general public. To acquire more subscribers Zuji is handing out free ice creams to members of the public. "As Malaysia continues to face a brain drain, it is expected the base salaries for these specialist roles will rise," said Priya B.. Check out the story of the sweet but misunderstood kiwi. ..
McDonald's continues to find itself in a pickle, after having been bombarded with angry Facebook comments by dissatisfied customer..